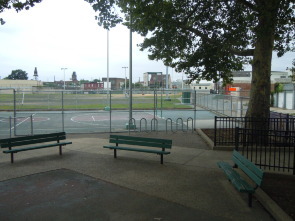 Shissler Recreation Center, bounded by Front Street, Norris Street, East Hewson Street, Trenton Avenue, Palmer Street, and Blair Street, and known as Newt’s to the neighborhood, is the last playground in the city to convert its cinder field to grass. 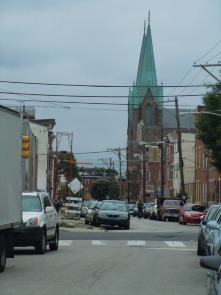 The reason may be that the neighborhood in which it sits—Fishtown (East Kensington)—lost much of its political clout over the course of the 20th century. From the postwar era until very recently, it was an impoverished white neighborhood, wracked by the relocation of factories to the southern United States where less stringent labor laws existed. By the 1980s the unemployment rate of Kensington was three times the city average. This was a far cry from a century before when Philadelphia, as an industrial powerhouse, was called “Workshop of the World.” The site of Newt’s playground was originally one of the first and most important railroad yards in the city, signifying Kensington’s importance as an industrial center and connecting it to New York. There is a strong possibility that the cinders of Newt’s playground are the same cinders used at the Kensington Depot as fill ballasts in the 19th century. The space was originally on Lenni-Lenape land called Kachamensi or “the place where the chiefs meet.” In the 17th century, lying in what the Swedes called Shackamaxon, it was owned by the Swede Gunnar Rambo and was subsequently purchased by Kensington’s first shipwright, John Bowyer who owned it in 1681—decades before the area was called Kensington or famous for shipbuilding. 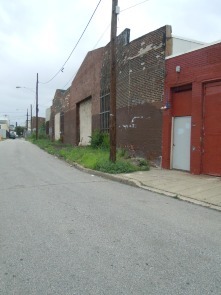 By 1834, the space was a railroad yard and housed the Kensington Depot of the Philadelphia and Trenton Railway, which dates back to the beginning of railroads in America. When it opened in 1834, the Philadelphia and Trenton offered two round-trips per day, “one train hauled by horses, the other by a Baldwin locomotive,” according to Railroads of New Jersey. The northern end of the yard bordered Isaac Norris’ famous Fairhill Estate. 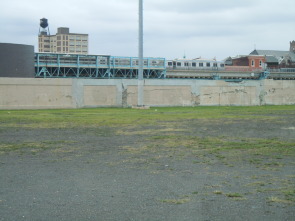 The Kensington Depot was the site of the famous “Railroad Riots” in 1839-1842, when angry Kensington residents as well as local politicians subverted an attempt by the Philadelphia and Trenton Railway to extend the tracks down Front St. to 3rd and Willow Street. “It was urged that the establishment of a railroad to be carried through the thickly-built portions of the districts would be dangerous to the lives of citizens and injurious to property” according to Scharf and Westcott’s History of Philadelphia 1609-1884. At night, residents tore up the tracks laid every day by the Philadelphia and Trenton railway, but the opposition grew far more violent, including riots and battles with the local militia in which paving stones, called “ground apples” were thrown at police. Finally, the state legislature and the railroad company were forced to capitulate. An army captain called for “an apology to the country for your speech, and particularly to the soldiers,” to which Ingersoll told the captain to “go to hell.” The captain struck at Ingersoll with his cane, but the Copperhead blocked the swing and swung back with his own cane. During the scuffle, Ingersoll received a blow to the left side of his face and he broke his cane over the arm of the soldier. Ingersoll eventually drew back and pulled a revolver from his pocket. He cocked the gun but was seized by a police officer before he could fire. Subdued but still defiant, the police took Ingersoll to the station, with the frenzied crowd in tow. 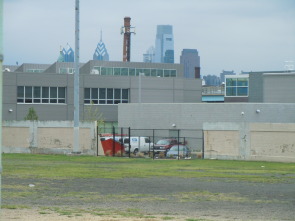 By 1923, the City of Philadelphia had established the Kensington Playground and Recreation Center “for the health and enjoyment of the people for ever.” Beginning in 1911, using its power of eminent domain, the City of Philadelphia condemned and appropriated roughly half of the railroad yard, which was at that time part of the larger Pennsylvania Railroad System and named the Kensington Freight Yard. 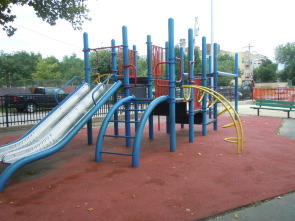 The city also appropriated the McNeely Estate contiguous to the yard in the east (McNeely had been a 19th century leather and morocco manufacturer) and razed some revolutionary era houses on Hewson Street to make way for the playground. Finally, it cajoled the Pennsylvania Railroad Company to build a stone wall separating the remaining railroad yard from the playground. By the 1960s and early 1970s, when Fishtowner Ed Charlton and other neighborhood kids used the playground which they called “Newt’s,” the neighborhood was facing rising levels of poverty. 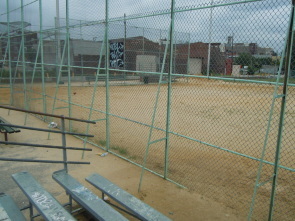 The playground was where all the Fishtown neighborhood teams played. 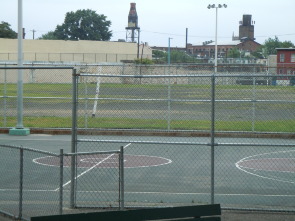 This included baseball, basketball, and soccer—“Soccer was big in fishtown because there were a lot of immigrants from eastern Europe- polish, Lithuanian, Ukrainians and they all had soccer teams.” Charlton recalls that nearly all the players were white, Front Street being the major racial divide in Kensington, and that except for women’s basketball, most of the players at that time were young boys and teenagers. 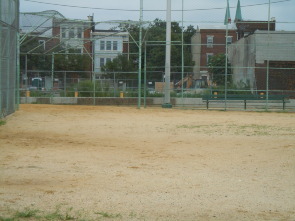 From the start, the baseball field Charlton played on as a youth was all cinders. 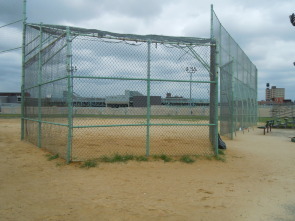 He recalled the unique challenges of playing at “the Cinder Pit,” as it was affectionately called at the time. Except for the dirt in the infield the entire field was cinders. There wasn’t any grass. From a baseball point of view that made fielding a little more difficult because the ball bounced harder off cinders. So when you learned to play you had to adjust to fielding. Also, if you fell in the outfield, you could be scraped, hurt because of the cinders so you had to learn how to do that. And you’ll find many people today who grew up in the neighborhood that played any sport there with the signs of cinders in their body. I have two big ones in my hand and in my elbow… But the funny thing about it is we didn’t think anything of it. It didn’t bother us at all, it didn’t prevent us from trying out for the baseball team or playing football there because there were cinders. It just seemed to be normal up until a certain age. Growing up playing on the all-cinder field didn’t seem all that bad until Charlton reached high school and traveled to other playing fields in the city and its suburbs. According to Charlton, Newt’s served as the neighborhood kids’ major barometer for understanding their economic position in the world. As you got older probably [on the]14-16 [and] 16-19 teams, you started playing teams from all over. Then you started going to areas where the teams to us looked like field of dreams teams. All grass, beautifully manicured, the base path drawn with white powder. 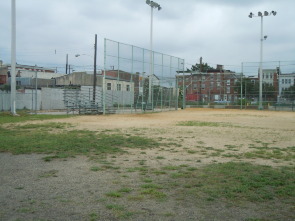 When you got to be 14, 15, 16 and traveling to other teams’ fields to play them then you started to realize, wow, we were living in a poorer neighborhood… But that didn’t really occur until you started seeing those other fields. Our traveling football team…started playing kids from other neighborhoods like Juniata and Bridesburg and Port Richmond and seeing their fields and facilities were really nice so you started seeing the different advantages and disadvantages…Again, it didn’t really bother us. It’s just then you became aware. And the other thing though is… it gave you this air that you thought you could beat the other team because you were tougher. Towards the middle to late `60s it became a battleground. 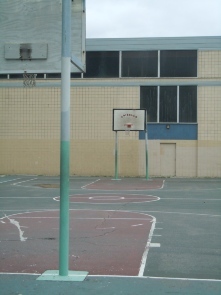 You could still go there during the day and participate in organized sports but at night it started to be controlled by gangs. For you to go there at night if you weren’t in those gangs meant that you would have to fight in order to not be beaten up… so it became a situation where unless you were involved in organized sports you couldn’t take advantage of the playground anymore. Nevertheless, Charlton maintains that when he looks back on his memories of the field, they are overwhelmingly good. 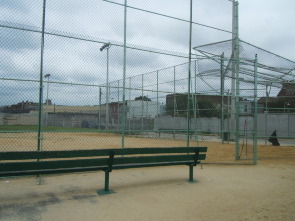 Now a volunteer coach himself, the playground was where he met one of the most influential men in his life, Palmer Reap, a man who dedicated many years volunteering as a coach at the Fishtown Athletic Club that used Newt’s baseball field. Charlton Edward. 2010. Interview by Ian Charlton. Tape recording. August 1. J. Thomas Scharf and Thompson Westcott, History of Philadelphia, 1609-1884, 3 vols. Philadelphia: LH Everts, 1884. Vol 3. pp. 2183-2185. Mueller, Norman of Reading Railroad Heritage Museum. 2010. Email to author. August 5. Smith, Bradley of the Railroad Museum of Pennsylvania. 2010. Email to author. August 18. Treese, Lorett. Railroads of New Jersey: Fragments of the Past in the Garden State Landscape. Mechanicsburg, PA: Stackpole Books, 2006. p.16. White, Jonathan W. "‘Words become Things’ : Free Speech in Civil War Pennsylvania.” Pennsylvania Legacies. 8:1 (May 2008). “Philadelphia History: Early Railroad Transportation.” The Independence Hall Association of Philadelphia. http://www.ushistory.org/philadelphia/railroad.htm.